While most have been witch themed, this one is a sweet, autumn concoction. And to fill the pages. I'll leave you with a few more photos of my Bewitching Books. There are a couple more pour paint canvas books with witchy themes in the Bootique now. This one has the outside covers in flow paint with a witch I've cut from an old photograph and spooky-foofed up. The inside covers are covered in old paper and the interior pages are a grey, parchment style card stock, ready to be embellished. This book has the same type of cover. Instead of it being a kit for you to finish, I've gone ahead and journaled it throughout, myself. Here is a close up of our sorceress, with her magic wand made of a trimmed pipe cleaner and topped with a vintage rhinestone spray, with its wire wrapped around the pipe cleaner. She has old lace wrapped around her dress, and a hat made from card stock that I'd painted. TIP- When adding a gown to a photo, it is often easiest to cut the person in half after cutting her out of the background. You will want to stretch the fabric around the figure and secure it with glue to the backside. And arms are often in the way. I either cut around the arms, or in this case, I simply cut the lady into two pieces, added the lace, and glued the two parts down onto the book to reassemble. And it looks better if you do away with the stark white edges of the cut out person by running a light brown marker or ink pad over them. 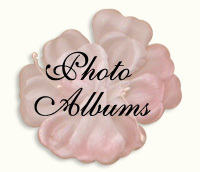 The "fastener" on the book is a vintage brooch. 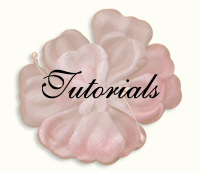 TIP- Old brooches look great on the side of a book to create the illusion of a closure. But, they sit unevenly. Take a pair of pliers and twist off the pin back. This one still had a sort of stump where the pin had attached in the center, so I punched a hole in the cover and added glue to the rim of the hole, then pushed the raised bit down into the empty space for the brooch to sit evenly More glue was added to the back of the pin that met with the cover. The first page is simple, I've used an ad from an old magazine for a funeral home (Thinking ghostly here). The leaves and flowers are glued over the hole I'd used to attach the brooch onto the front of the book. 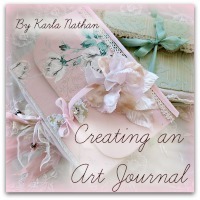 TIP- Lots of lace adds a lushness to a journal. I like to start a book with some trailing from the first couple of pages. And add it to different sides of the pages throughout the book, on this page it is on the side and bottom. To hide the pleat, I've added a flower. The ghost if from an E-zine I did with Beth years ago. It was called ROMANTIC GOTHIC GHOSTS and included full directions, tips, plus a lot of images to download and print. It is still available here: http://bethleintz.typepad.com/workshops/, scroll down, there are two zines to buy, the first one is a Xmas theme and the ghostly one is at the bottom. My book features both copies and originals. It has vintage paper and scrapbook paper. The sepia girl is a color copy of an old photo, glued to original, vintage text, simply accented with a velvet ribbon and velvet pansy for nice textures. The next page is scrapbook paper, with a girl cut out of a black and white copy of an old photo. I've used marker on her flesh to make her look "wicked". TIP- I find it easier to color the people before cutting them out of the photos. And I use a blendable marker in lighter green, then a slightly darker green where you'd apply eyeshadow, for depth. Marker also works for lips, but please use a red colored pencil to get a realistic blush look. Add 3D elements like the cameo or hair bow for accents. The moths are cut from copies of images found on Romantic Gothic Ghosts, glued onto plain, gray scrapbook paper with black ink around the edges. TIP- Simply done pages can add a lot to a book. Not every page needs to have a lot going on. Next, is another girl I'd treated to a wicked tint. Her dress is lace, and her hat is cut from other paper and added to her head after she is glued to the background of vintage texts, layered on the page. TIP- Striped socks are an easy way to change a girl into a witch, just color the socks with marker in a basic color and draw the curved lines with pen. On the left is scrapbook paper from a Halloween book, with a spiderweb. I've drawn over the web with a metallic pen. The girl and her cat were cut from a black and white copy, and colored with markers and glitter pens, then a bow was added to the cat. On the right, a small envelope was covered with a vintage image, color copied and accented with glitter pens. It has a ribbon wrapped around it, and then was glued in place. TIP- Use envelopes and pockets in your books to tuck away treasures or surprises. Another simple page with a big impact, bat themed scrapbook paper, topped with a copy of a poem, and a cut out of a grieving woman. Her dress has been accented with glitter pens. The paper used on the right was also from the Halloween scrapbook pad that I had, but I have added a few hand drawn branches to the background. The pumpkin was drawn onto sheet music, colored with markers and glued down to the page and moss was added over it. The words were printed in black and white and colored with gold marker, then highlighted with glitter pen. TIP- Hand drawn or colored elements, whether free hand or done by coloring stamps or stencils, add a lot of interest to your pages. The raven is a printed copy, with the bird itself accented with glitter pens, and the background left with its matte finish. The bottom of the page is trimmed with tattered lace, topped with velvet ribbon. TIP- Your lace doesn't need to be pristine. Old and tattered bits add character to a book. The witches on the other side were ladies from an ad in an old magazine. I've added hats made of glitter card stock and millinery blooms. TIP- For a more finished look, I ran a black ink pad along the edges of the glitter card stock hats. The same moth image from Romantic Gothic Ghosts that I'd used on an earlier page is used over glitter card stock on this page. It is colored with tones of brown markers and a little glitter. The same style of layering squares over text was done on the left page for a cohesive look. TIP- Do not be afraid to reuse the same images or ideas in slightly different ways, throughout your book. Reusing themes can bring unity to your pages. I've done a similar thing on these facing pages. Instead of squares, I've used ovals, layered with the images. TIP- Not all dangling trim needs to be lace. Here, I have a knotted ribbon that hangs down past the bottom of the book. Both of these pages have scrapbook paper as a background. On the left, I colored the page with a glitter marker in gold, the cut an owl image from another scrapbook page and turned it into a medallion by adding a crepe paper ruffle to the back. The spider is cut from an image (Romantic Gothic Ghosts) then printed onto a transparency. TIP- Photos or images printed onto transparencies or vellum paper can give you a ghostly feel or some nice texture. Here is another moth, taken from a biology booklet, centered over a gothic arch. I've used the same vintage wallpaper in two different ways on these face to face pages, along with two styles of gothic arches. The couple easily became a witch and warlock by tinting their skin and adding hats. These pages are a patchwork of vintage papers, layered with a flower and an envelope. I've drawn a flourish on the page with the flower and colored the black and white image on the page with the envelope. The last page shows the same moth I'd used on two other pages, one as is, one tinted. This time it is printed on a transparency. Velvet leaves were scattered onto the page for texture, and words cut from an old book add atmosphere. TIP- I make a file of interesting phrases or words and snip them out as I come across them, and save them in the file for later. If you are specifically looking for just the right words in old books, you will spend all of your time searching and none of your time creating! So, when you see something interesting, snag them then and save them for the future. I'll be adding this info to my tutorial, "Creating an Art Journal", it is filled with lots of ideas and designs for making your own books. Two different classes will be held here at the Cottage in October. On Sat. the 3rd, we will be making an apothecary jar housing a cute witch surrounded by transparent ghostly images. And since it is Karla's Cottage, you know there will be choices and we will be using the Good Stuff. I'll have an array of witchy girl kits for you pick from and make to use in your jar. On Sunday, Oct. 4th, we will alter a book with haunting, and mysterious elements. You will make a complete book that day, and receive a trick or treat bag full of delicious goodies to finish the interior pages, if hobgoblins don't allow you enough time to work on the inside that day. The pages themselves will be printed papers that I have scanned from vintage fortune telling and astrological pamphlets. So your spell book will be ready for embellishments and additions of your own over the top of the moody backgrounds. The apothecary jar will be filled with ghosts. They will be haunting a diminutive witch with her cat, and a pumpkin. I'll provide one hand made paper clay gourd, and you will make another one yourself. The trees behind her are covered in black millinery leaves and draped in cobwebs. There is a lot of detail to each little witch in the jar or on the book covers. Your trapped, bewitching charmer in a jar (made on Saturday) can hold a magic wand, or a broomstick, both will be hand made during the class. The book cover (made on Sunday) features 2 young crones, one waving a wand, the other one swishing her broom. Our colors will be neutral and black, no garish oranges. But I do like the very faded, old purple of these 100 year old millinery blooms. So if you want a touch of violet for All Hallow's Eve, I think these are the way to go. And these tones of vintage ribbon flowers are a sweet addition to the spellbinding girl's gowns. A touch of color here and there doesn't take away from the black and ecru of either creation, since these are such mellow, old tones. Especially for our sweet, mini sorceresses. This antique gown from a distant wedding date is properly decaying for our haunting creations. I'll have snippets of it in each kit. And please feel free to rip into it for use during the weekend. Each project kit will be filled with romantic elements to create your piece. And of course, at Karla's Cottage, there is always a table of extras for personalization. I love it when no two finished artworks look alike. We are going for a look of timeworn beauty, not modern Halloween. Expect luxe supplies and lovely images for our specters and sorceresses. And remember, only bad witches are ugly. Both classes will fill a day, and if you are fast worker, there will be plenty of extras for you to play with while hanging out with our fiends friends, and chatting away as we create together in our little coven of crafters. Goodies will be served in the haunted treat cabinet, and we will break for a homemade lunch. You are welcome to attend one class or both. Each is from 10am-5pm with lunch at 1:00. If you'd like to join us here in Lawrence, KS (50 minutes from the Kansas City, MO airport) please email me - karlanathan@sbcglobal.net -for an invoice. This is a limited sized class. I'll leave you with some more photos of the projects. I hope to see you here! Have you seen those cute little velvet pumpkins every where this season? I'm not a sewer, but I thought I'd give it a try. This one is cut from a skirt of a vintage black velvet dress. Its tiny, and the black doesn't show up as well as the other colors I've seen. If I make another one, I think I'd do it a little differently. But this one satisfied my urge to own one and I didn't spend $25 on it, I used what was around the studio. Hmm, looks a bit like an apple, though, doesn't it? My studio seems lonely now that Romantic Gothic Ghost workshop is over! I'm enjoying all the decorations and will leave those up for a while. They remind me of all the fun we had. Too bad I can't have a roomful of friends and family more often! What a great way to spend a day. The pups were extra needy after everyone left, they had gotten lots of attention for a few days while we had company, then all of a sudden, they were left with just me trying to keep 9 babies attended to! Laurie has a world record set in holding all 9 at once! I usually balance one at a time. Sissy made votives for everyone, with images printed on velum. I found the spider web bags full of gummy candies at Victorian Trading Co. There were lots of gifties to go around. For the door prizes, I drew names and let each person come up to the table to chose a pressie. I think that worked out well, hopefully everyone got something they liked. I hope they enjoyed the classes too. I know I did. Beth's class was one of those where you could just keep going and going on the pages. I ended up working on mine for days, adding more and more to it. That is kind of what my wishes for the class at Kim's to turn out like. Students will make a basic book, and I'll be giving them directions, plus Good Stuff to work with, and they can be as creative and inventive as they like with it. Books are perfect for exploration. I liked the variations on my Raven class too. if you'd like one for $25 plus postage. Dewdrop's mommy, our Gypsy, came to the classes, and also volunteered to give readings. She is skilled with the Tarot cards, and it fit right in with our theme for the day. The room was decorated in past projects I'd done for demos for the Romantic Gothic Ghost online class. I used the free images provided in that class for the Ghosts hanging around the room too. They are printed on transparency, then blotted and cut out and hung with cheesecloth and tulle. I've used them here, there and everywhere, from the ceiling as well as in apothecary jars and frames. So, I'm going to enjoy it while its here! I'll tell myself not to grumble as I pack it up after Halloween, and try to just remember how much I loved having everyone here with me instead. Maybe I should have a box of Xmas goodies out and ready to swap when I take the Ghostly decor down. I might just skip over Thanksgiving. Oh, my, I think I'm more tired than I realized! I should go snuggle some puppies and take a nap. I'll leave you with some photos of the weekend. I wish I had taken more! 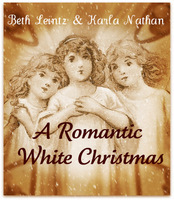 Beth has some on her blog too. And I wish I'd had more time to mingle! There just wasn't enough time to visit. A two day workshop is better for hanging out. But on the other hand, this one was such fun, and so much easier to pull off. I could probably juggle more workshops if they were one day only. Our ghostly weekend was a real treat. I just hope my guests enjoyed it half as much as I did! We had such a lovely group, and it was so fun to have a family reunion along with the class, I'm thrilled that my family got to meet some of my friends and see what I do. This envelope was in a scrap pack of ephemera that Pam won as a door prize, and look at the date! Our class was exactly 103 years from the day this was written. Another ghostly oddity of the day, was that every single picture that I took of a person had a glowy smudge look to it. At first I thought all my photos were ruined, then I decided to just go with it and enjoy the ghostly effect, and edit them even more ghostly. I looked on my lens and saw that there was a real life smudge, not a ghost doing it. I'm lucky that I got any photos at all from the weekend! The close ups of things around the room weren't too bad. And except for some halo around the lights, the whole room shots weren't either. But portraits sure had some spookiness to them. I loved every minute of the classes. Beth's was so much fun, I had to drag myself away to make lunch. I served quiche that day, instead of making it up ahead of time, I wanted it fresh as can be, with eggs just gathered, so waited till it was time to go into the oven to make it up. We also had green salad with cranberries and candied pecans, and a fall veggie mix of squash and sweet potatoes. And of course, way, way too many desserts! Carmel apple cupcakes, lots of brownies, and these white chocolate witch hat cookies. I set up an extra table for seating in the living room. And decorated it with a 25 cent black lace shawl from a garage sale, and $2 bunches of roses that were marked down at the grocery store. I cut them short, and made an arrangement with the stems too. Remember how Morticia and Gomez from the Adam's Family always put the stems in the vase and threw away the flowers? I wasn't up to tossing the roses, but I did arrange the stems. With a family reunion going on this week too, it was handy to have that table in the living room, I left it up the whole time, and it got used a lot. Normally, the studio is where we have our family dinners when a big group is here, but this time, the studio was occupied with all of the set up for my Ghoul Friends and the classes. Sugarwings came to spend the day too, her mom was studying and our fairy girl kept herself entertained while we all worked in the studio. She is getting so grown up! Before our guests arrived, she wanted to get all dressed up in her wings and her new fairy dress from Aunt Bobbie, because she said, "Grammie's friends think I am a real fairy, so I'd better wear my wings!" The puppies joined the party too. They missed all the attention after everyone left! I miss all of our friends and family as much as they do. The house seems so empty now that its over. Time to plan another party.... While the studio is decked out I think I'll throw another Halloween bash and have my buddies bring their kids over for a craft day to make masks. Sugarwings saw all my decor for Romantic Gothic Ghosts and wanted to help. Her tastes run more to the traditional colors of Halloween, while I was trying to keep my palette orange and purple free. But I admire her work and sense of style too, so I let her have free reign over her project. We picked up a "Grammy" and a "Sugarwings" scarecrow (half price last week at Michaels) and clothed them in some witch clothes from our dress up closet. Next came the make up. Lots of marker and glitter work went into this. At least an hour's worth of foofing. Then, the ladies got some jewelry and accessories. Everyone who is coming to our crafty day in the studio knows how I feel about Sugarwings and her art work. I think they will appreciate her efforts to welcome them, even if she follows her own palette and differs from our theme, don't you think? The room is ready for our guests, and the treat cabinet is decorated like a "haunted mansion" as Sugarwings calls it. I've been baking up a storm and this will be filled with goodies soon. Family arrives here on Thursday and my Ghoul Friends, or Lovely Spirits come on Saturday. I'll be pretty busy having fun, so I have pre-posted on my blog for the next few days. Well, no kits are made up yet, but I do have the studio cleaned and decorated for Romantic Gothic Ghosts next weekend. I'm feeling close to being ready. Maybe I spent a bit too much time on the fun stuff, but the room got cleaned up as I went and its always much more interesting to kind of foof and redo as you clean, isn't it? That makes me feel like I actually did something other than knock down cobwebs. Of course, its a Halloween party, so I could have just left those up and gone with that. I decided that I needed another door prize to give away. Friends and I swapped prizes for each other's events, but I wanted to make a couple more too. This is a stack of notebooks glued together and decorated. All of the covers, inside and out are embellished, and the notebook paper was dipped into coffee to age it a little. Of course I used "The Good Stuff"! That is the only way to go. To hide the seam where the books were stacked and glued, I covered the bindings in vintage black velvet ribbon. In the center of the book, is a page filled with envelopes to hide special tidbits in. Other door prizes are from Karen and Jennifer. Jennifer is hosting The Gathering this weekend, and I donated a couple of prizes to it. 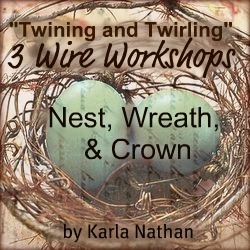 A wire wrapped nest and the online Three Wire Workshop. You can read more about the Gathering on her blog. My good buddy, Carol. will be the guest speaker and I hope to go to hear her. She is always entertaining and full of info. 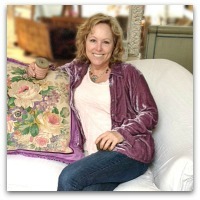 Karen's holiday party in Mt Dora, FL is sold out, but she will have another event in Texas in the spring. If you are wondering why there is nothing new in the Boutique.... well, I've discovered, you just can't do EVERYTHING, no matter how hard you try. But I get done as much as I can. Yesterday I made 20 some paper clay pumpkins with sticks as stems, painted them white and they are ready to drop into the Raven's Tea kits (when I have kits ready, that is). The students will guild and glitter them and add them to the tableau. That is probably the first time in my life that I have used the word Tableau. Anywho, the students will get the walnut dyed, coverless book to wrap in ribbon, goodies to make the rhinestone accented tag, and the pumpkin to finish and set next to the teacup. I still have TWO spots left for our own party. If you want to come out to visit the cottage and meet the chickens and the pups, we'd love to have you! If you can't come to visit and take the class, but would like some How-to's from me, here is an article coming out in the next Jewelry Affaire. Its always a pleasure to be featured by Stampington in one of their many wonderful publications! Right now, this is what my kits look like. I think I'd better step away from the keyboard and get to work! Dewdrop came over with her mom to do a practice class for Romantic Gothic Ghosts. The babies came outside to play since it was such a beautiful afternoon. I left the studio door open and made a pen for them right outside. The little guys played so hard, they tuckered themselves out and just fell asleep where they stood. It looked like the aftermath of a fraternity party. One even fell asleep with his head in the food bowl. Dewdrop was perfect at her first big girl craft day. She decided she needed an apron to wear while she worked. Her favorite part was the pockets, she filled them with so much she could barely sit down. Her Gypsy mama created one of Beth's books for the upcoming class. Beth is providing lots of great materials, and I got out some of the images from the online class too. I made a book while Beth made my Raven tea cup project. It was fun to try the faux tintype technique. No two books from the class will turn out the same, Beth is providing lots of goodies and tidbits, and some kits will differ. My book and Dewdrop's Gypsy mama's book looked very different from Beth's. I can't wait to see all the variations that the rest of the students come up with! Of course, there were lots of breaks to play with puppies. I'll leave you with some more of the pages our Gypsy created, she really had some nice ones. She made it her own by adding some gypsy colored ribbons here and there. The studio clean up is progressing. Kinda. If I just wouldn't let the mess pile up in the first place, it wouldn't be as hard. If I could concentrate on cleaning instead of getting side tracked with little projects and decor ideas, that would help too. I can be elbow deep in clearing off a table and all of a sudden, an idea pops into my head and off I go, to work on that. Like this witchy hat. The dress form in the corner looked like it needed to be dressed up a bit for the weekend, so I added a black lace jacket and skirt, then decided I needed to whip up a hat to match. Of course, I didn't really NEED one. It was easy and fast, using the steps from the Romantic Gothic Ghost online class. This hat is a "bonus" class that I added to the existing lessons. The witch's hat was last year's bonus class, and the BOO tussie mussie is this year's. I added a few new images too, for downloading and printing. If you have paid for the class when it first came out, and forgot the password, let me know. Its worth a second look, and there are new things too. This isn't one of the projects, but is a FAST and easy one that really needs no instructions. I used the spider and web image in our files, printed onto a transparency, layered it over a cut out "ghost" girl, and popped them into a frame. To be honest, I did it in such a quickie, short cut way, that i taped the picture to the wall, and hung the spider and frame on the same nail. Something that is only hung up seasonally doesn't need to be done perfectly. Another quickie decorating job to save me from cleaning was adding construction paper masks to some of my ladies. You can tell from this photo that I'm desperate to avoid making kits and cleaning. Yes, I have covered the hand wipe cannisters in ghostly papers. I came across a file folder filled with printed images I'd made up from the online class and never used. So, of course, I quickly found some where to glue them. I hope someone stops me before I start decopauging my broom. Its so much more temtping that actually using it. And hey! Don't you think that it would look cute next to the witch in the corner!!?? I was making a joke, but now, I think I might go and do it. Bye Bye Fairies, Hello Ghosts! Isn't this fairy from Linda sweet as can be? It's sad that the Faery Book Swap is over! I made a couple more pages, as thank yous to some sweet people. And I have extra covers that I hope to list on Etsy or in the Boutique. If I ever get a spare minute to do it! In the fairy frenzy, I'd made up about 16 pages for the swap, and didn't need them all of course, so I'll have a few of those to list too. But I didn't want to use any of those as thank yous. I thought "thanks" deserved something made special just for it. I still have my family's books, they weren't mailed because we are going to open them all together when everyone gets here to visit for Romantic Gothic Ghosts. I'm so glad that Guncle Randy, Sissy, Bobbie Sue and Terry can come out to play with us for the classes! We hope to go to see the annual Lawrence Zombie walk if everyone arrives in time, it will be on Thurs. the 4th and family is flying/driving in from Utah, Florida and Indiana. Then, Friday is shopping at the West Bottoms district, with all the once a month junk and antique stores, as well as Bottoms Up. Saturday the 6th will be our ghost filled craft day, with Gypsy spells and ravens. Sunday we plan on hitting the Renfest, all decked out in our fairy attire. A perfect little reunion!! Plus I get to have my blog friends meet my family, that will be nice. I'm glad that we are having a workshop while the relatives are in town. Along with the thank you pages, I mailed out hand made envelopes stuffed with tidbits. To make these, I looked at a regular envelope to get an idea for the pattern, cut it out from an old book page, folded it up and glued the edges. Simple, and kinda cute. I might need to do more of these! I've gone straight from sweet fairies to gothic ghosts. These images (provided in the online Romantic Gothic Ghost class) are printed on transparencies and hung around the room. And the room is a WRECK! I've started cleaning and decorating, but need to get all the chaos and clutter out too. I started decorating at the ceiling first, then the cabinet tops around the room. I'm sure most people would have cleaned the whole room, put away the mess and then started fixing up. But I got too excited about making the ghosts and had to do the fun parts first! Speaking of photos, I've noticed that no matter how good my camera is, and how well I edit pictures, they NEVER look as good on my blog as they do on my computer files. I wish I could fix this.... I also noticed that if you click on one to open it in a bigger window, its sharper. Another instance of backward preparedness- instead of cleaning and making kits, I wanted to make some ghostly images to set around the room. This collage is an old trinket box with a glass lid that Beth gave me. I took out the image that came it in, turned it on its side and made it a shadow box. A transparency spider image is across the glass, and a ghostly girl is layered over a gothic arch (from the albums full of pictures and images and backgrounds and patterns that were scanned and added to the online class) and glued to the back of the box. I then added some tatted trim and some very old, beat up flowers. Its very small, and I seriously doubt that it adds a lot to the over all decor of the room. But it was something I really wanted to do. We had lots of projects made up for the online class that I pulled out to use around the room too. This tag is pinned to my new curtains, hung just for the occasion. The tag is one of the "ready to go" bonus images from the class. All you do is print it and cut it out. The curtains are from the Sparks Flea, and were $1. When I bought them, they were a hideous, fleshy peach. But I liked the over all pattern and the flocking was cool, so I gambled that dollar and bought them any way, hoping a bowl of dye would take. It did and now I just love them.! Thing is, though, I bought them thinking I'd cut them apart to use in projects, and to test the dye, I cut a hunk off the bottom of one to dip. I loved it so much, that I dyed the rest of the panels and hung them up, even with a hunk missing at the bottom of one. 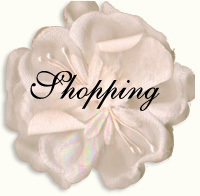 In the window, is a banner also made from the Romantic Gothic Ghost online classes. There are tons of projects, decorating ideas, and printable images in the class. I'd forgotten how much there was in it, and had a lot of fun looking through it with fresh eyes. 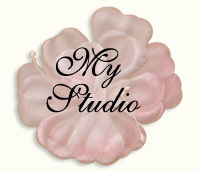 Everyone coming to the class at the studio gets the online class free too. We still have a couple spots open for our one day party in the studio if you'd like to join us.